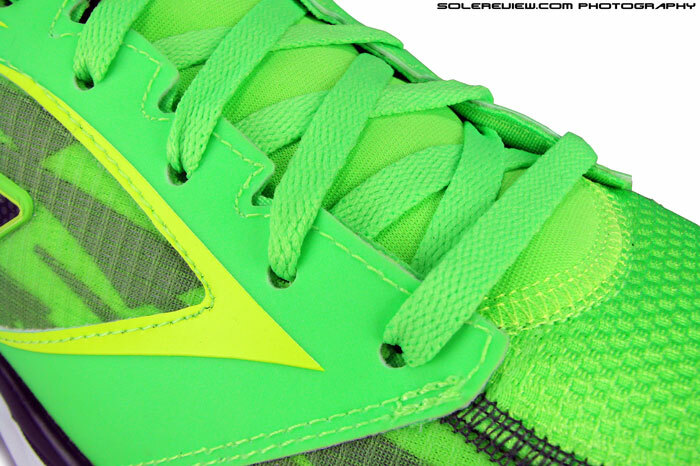 Upper: Closed mesh, glow-in-dark synthetic. 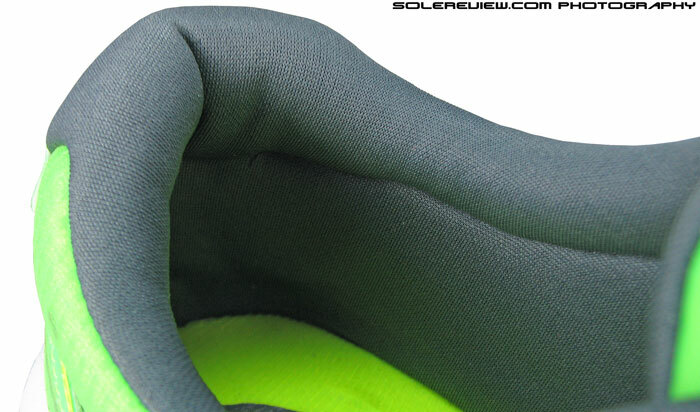 Midsole: Single density, injection molded EVA foam. 4 mm heel drop without insole, and 8mm with. 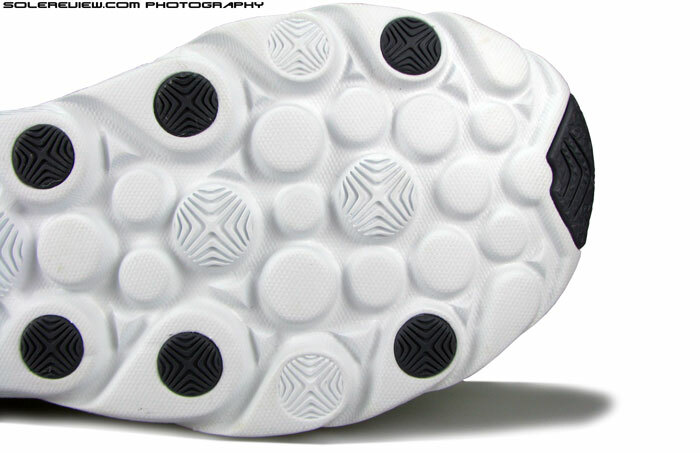 Outsole: Injection molded EVA foam with rubber pods. The 4mm heel drop GoRun Ride 3 is Skechers' everyday running shoe, which is great value at $80. Very lightweight, though cushioning feels flat and firm during runs. Not a negative, but it behaves differently at lower vs. higher speeds. From Britney Spears and Kardashian to Meb and Miss Goucher. That’s one heck of an evolution. A few years ago, who would have imagined that Skechers would been taken seriously as a running shoe brand? The California based company had long been known to focus on marketing celebrity endorsed, lifestyle biased footwear. The first time we actually heard of Skechers was when the brand and 90’s pop princess Britney Spears got into a legal spat around merchandising of roller skates. And a couple of years ago, Skechers was involved in a controversy around its Kardarshian-Brooks-Burke promoted ‘Shape-up’ footwear line, when it had to settle a class-action lawsuit by agreeing to pay $40 Million as refunds. As of September last year, consumers were busy cashing their refund cheques sent by the federal trade commission. It wasn’t alone; Reebok had to pay $25 million too, following its ‘Easy Tone’ blowup. In 2011, Skechers trained its guns on the performance running footwear market, and kicked that off by signing Meb Keflezighi in August the same year. While Meb helped Skechers authenticate their new foray in this category, it wasn’t until he won the Boston Marathon that Skechers perception as a running shoe brand elevated significantly. In retrospect, Meb’s endorsement couldn’t have come at a better time; Nike had just dropped the then 36 year old Meb from its roster, and Skechers was looking for someone to make their new category instantly credible. Given its casual footwear history, the brand from Manhattan beach must have also realized that it did not have the technical know-how to make credible, performance products. In comes Kurt Stockbridge, a Nike veteran with extensive experience of footwear development, who probably translated Meb’s insights into something tangible. In these two instances, Nike’s loss was Skecher’s gain. And will that trend continue with Kara Goucher, another ex-nike athlete, who recently signed up with Skechers? She just came in sixth at the Philly Rock ’n Roll half earlier this week, and for a comeback race, that’s undoubtedly impressive. Can Kara do a Boston Meb at the 2014 NYC marathon? That would be something, and would augur very well for Skechers. The GoRun Ride 3 is middle ground between the bulky Ultra and GoRun 3/Speed. Regardless of Skechers’ meteoric growth in brand perception and stock price, the latter’s performance running footwear line is still in its infancy. There’re a lot of shoes (and clutter) in its line-up, but the essence can be distilled into four major models – the GoRun 3, GoRun Ride 3, GoMeb Speed 2 and GoRun Ultra. There are elements of differentiation across these models, but at the same time a common design and construction language runs across all. 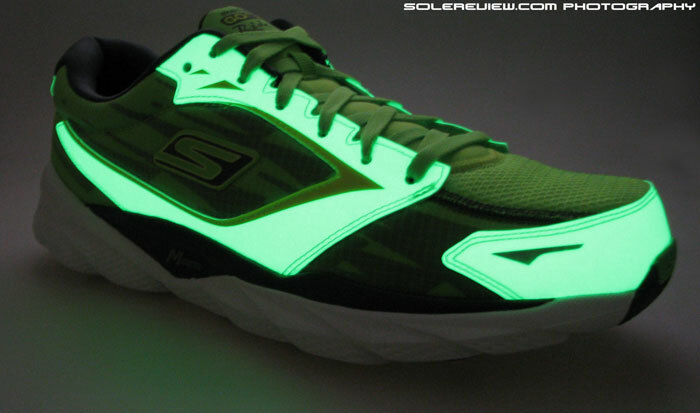 Look at what that is, and Skechers has a few things going for them. While Skechers performance division was likely conceived during the minimalist boom of a few years ago, it did well to straddle a fine balance between full out minimalism and current trends. On one hand, the element of low heel drop and lightweight construction – a remnant of zero drop boom – is still very relevant. While at that, Skechers also throws in a lot of midsole stack height too, an attribute which finds favor in face of Hoka-volution. Finally an accessible, sub-$100 price is icing on the cake. This GoRun was a NiteOwl edition. The synthetic leather absorbs ambient light for gradual discharge in dark. The Nite Owl edition is incredible fun. ‘Charge’ the shoe upper with bright light, and then see it glow for a few hours. Toe box is roomy, insole or not. There’s a reflective piece on the bumper, in addition to the Nite Owl edition’s glow in dark powers. 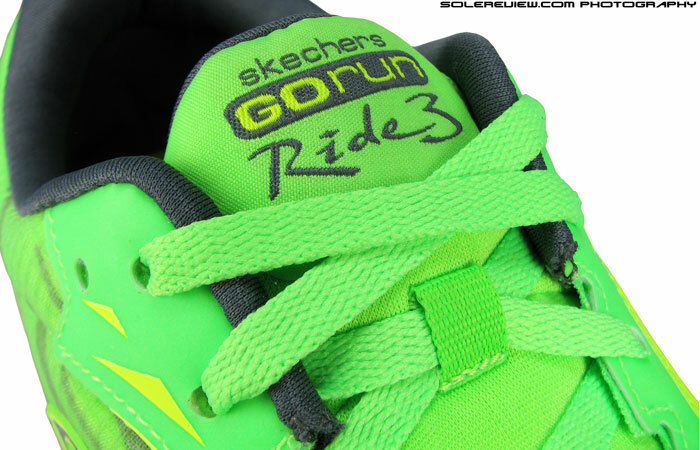 The GoRun Ride 3 sits somewhere in the center, offering a bit of everything what Skechers’ line stands for. It’s got a 4mm heel drop, very lightweight at 8.6 Oz/244 gms for a US 11 and throws in a fair bit of cushioning too. We picked up the Glow-in-dark ’Nite Owl’ edition which has a slight up-charge over the regular model, but from a construction perspective, it is all things same as a regular $80 GoRun Ride 3. What the Nite Owl has as an extra is the use of special synthetic leather which absorbs light and then discharges it slowly at night. Very, very bright, like a small lamp when starting off on full ‘charge’. The regular GoRun Ride 3 doesn’t feature such extravaganza, but instead offers two pieces of reflective elements on the toe bumper – which is also there on the Nite Owl edition. This label is wrapped around the optional pair of insoles with an explanation. This review is slightly different from others, because Skechers threw in a variable here; a pair of optional insoles. The outcome as far as upper fit and ride behavior is concerned depends on whether you choose to use the insoles or not, so it’s important to talk about both. We’ll also go over the shoe’s ‘Mstrike’ claim – which is supposed to ‘promote midfoot striking’, in Skecher’s own words. 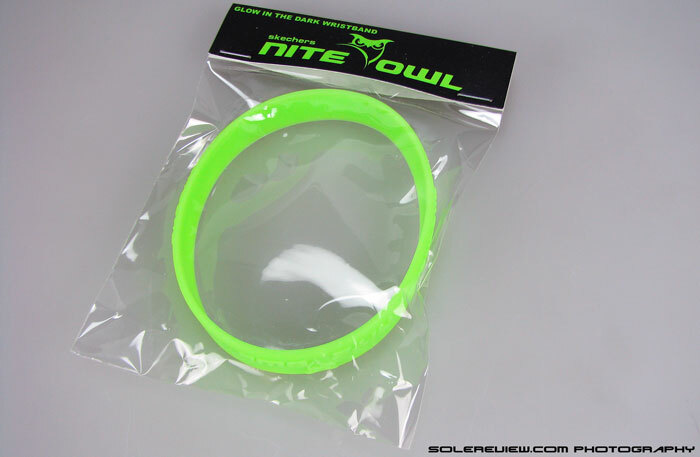 This glow in dark bracelet comes free with the Nite Owl edition. Flip open the box, and the GoRun Ride 3 greets you in all its florescent glory, with a pair of custom fit insoles thrown in. 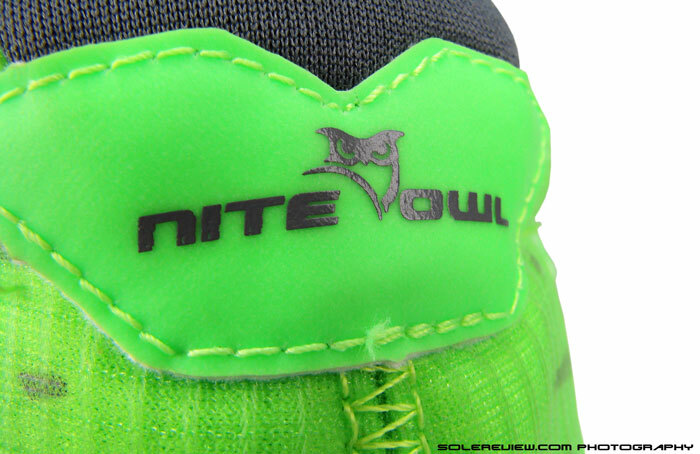 This is the $95 Nite Owl colorway, so there’s a glow in dark bracelet to go too. The paper label wrapping the insole briefly explains when and why you should use the sock-liners. It points that you should use the insole-less setting in case you want a more minimal experience; and on the other hand, the insole gives you ‘more protection and support’. As underscored earlier, the use of insoles noticeably alters the shoe’s behavior, so let’s begin by reviewing the GoRun Ride without the footbed. Lightweight, foam padded upper lining. Also attached to the upper is the integrated green strobel. The strobel of the Skechers GoRun Ride 3 also doubles up as an integrated insole, topped with a soft mesh, printed logo, and a low density foam layer between the fabric and EVA midsole. This is attached to the insides of the upper by means of reverse seams, blending it aesthetically. The lightweight, foam backed strobel lining makes the shoe come across as well cushioned the first time you try them on; and the injection molded EVA midsole also plays a part in cushioning. If you’re limiting its use to low intensity exercises such as walking around or slow runs, the Ride 3 will feel well padded. Skechers blends in elements like a low heel drop, low weight, and decent amounts of cushioning. But once you do some actual running in the shoe, the sensation of soft padding quickly evaporates. The lightweight foam just underneath the foot will flatten out under increased load, and so does the EVA midsole, which Skechers calls Resalyte. The midsole might feel marshmallow soft to touch, but it actually rides firm under running pressure. As with most lightweight EVA based foams, compression limits are tested fairly quickly once bodyweight is applied. The cushioning feels padded but flat and unresponsive; not a bad thing at all as long as you manage expectations. A flat ride feels good for tempo, and the ground feedback shines through too. The sole has a wider base throughout from heel to toe, so as expected of such a design, there’s a good quality of transition and stability. If you want the cushioning to be more responsive, it is best to buy the GoRun Ultra instead. The toe box is made of stretch mesh. The upper fit is very roomy; and maybe just too much. The only place where the shoe feels snug is on top of the tongue, otherwise it’s all around bagginess. The forefoot space is something we don’t mind – it gives good splay room and an unrestricted range of motion for the forefoot. Vertical room is great too, with no toe poke happening in the front. Even if it did, there’s this stretch mesh right on top of the toe box which has an ample amount of give. However, even with all the forefoot space, there’s some disparity between the medial and lateral sides. The forefoot has plenty of space around the smaller toes, but come to the inner (medial) side, and the side of the toe feels relatively crunched. Insides of the Ride 3. Not seamless, but uses soft materials. Synthetic leather overlays, with flat lacing. Despite Skecher’s claims of using flat lock stitching to result in a ’seamless construction’, the sorry truth is that there are plenty of seams inside. Ironically, there’s a strip of backing material right beneath the flat lock stitch on toe box, and that is felt when you go barefoot. A gap/seam was also felt right under the medial base of right toe; these couple of niggles doesn’t make the GoRun Ride 3 foolproof from a barefoot use angle. The shoe is best worn with a pair of socks, insole or not. Also noteworthy is that the pointy ends of the synthetic leather eye stay tend to poke in during flexing. Isn’t uncomfortable with socks, but will be felt while going sock-less. The GRR 3 has an unattached tongue, and it slides to one side during runs. Collar padding has ample quantities of foam, but grip will change depending on whether you insert the removable insole (or not). 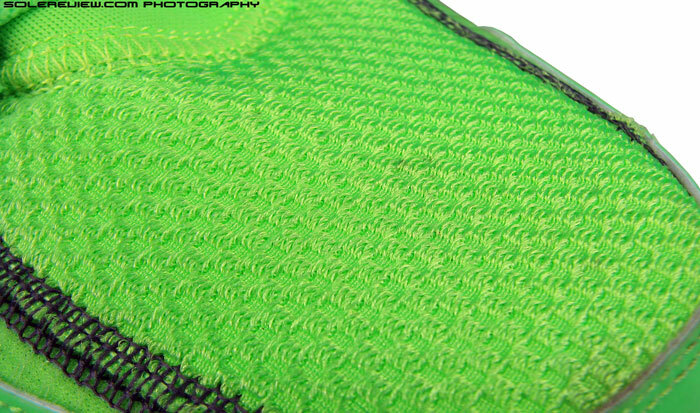 Mesh collar is tightly packed with foam. The tongue is a basic attachment, with no sleeve or gusset to keep it from sliding. So it does, moving across to one side a mile into the run. 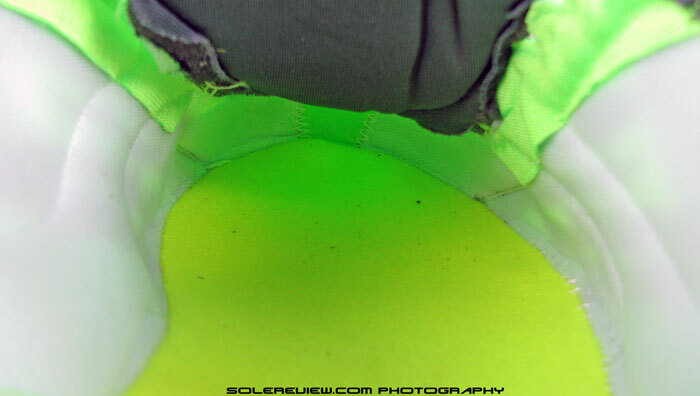 This is taken care of in the GoRun Ultra, so buy that shoe if tongue slide is an issue for you. The midfoot sides also have a fair amount of slack, and there isn’t any arch support to speak of. Sure, the midsole provides some midfoot support, but no contribution from the upper. 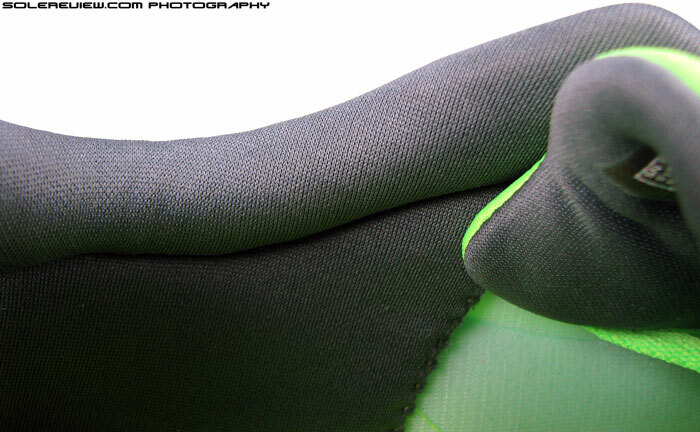 And finally coming to the collar area – the edges are packed tightly with foam and extend right upto the tongue lip. Despite that, fit isn’t snug without the insole. The reason behind that is very simple.When you don’t use the insole, the foot sits deeper inside the shoe, which means the collar walls reach high up – higher than they should be. The rear-foot is thinnest just below the ankle bones, and then flares outwards as you go downwards towards the base. With high collar walls, it ends up being around the thinner part of the foot, and above the flare – slightly removed from where it should ideally be. As you might have guessed, things change once you drop the insole in. Before moving on, we’d like to call out that the shoe runs large if you decide to wear them without an insole. Get half a size smaller in that case, otherwise it’s your regular size with the insoles. Comes with a pair of insoles to adjust fit levels. 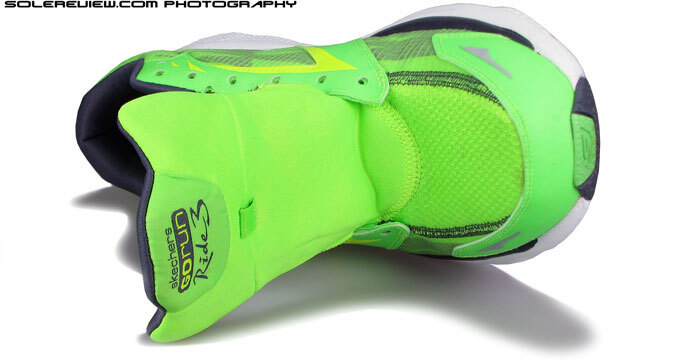 The removable insole is regular EVA foam. Drop the pair of insoles into the shoe, and the difference is telling. The footbed is thicker in the heel than the forefoot, so the cushioning behavior changes in the back. Creates a second layer of insulation, and takes away some of the ground feedback which we highlighted earlier. The ride still feels flat and unresponsive, except that you feel a bit more ‘removed’ from the running surface and feels less like the 4mm drop shoe the GoRun is supposed to be. Frankly, we personally preferred the more minimal ride without the sockliner. However, putting the insole results in some improvements. Like the collar grip become more effective, as the footbed reduces the depth of rear-foot upper. It also makes the midfoot much snugger, in a good way, and the forefoot fit also feels optimum. One analogy would be the difference between a medium D width and a wide 2E, except that in this case the change is spread all over instead of just the forefoot or instep. Most of all, the shoe just feels more stabler. The fit without the insole felt loose, and just felt unstable, with the lack of foot lockdown. With the insole filling out the space, the upper sits much better over the foot. 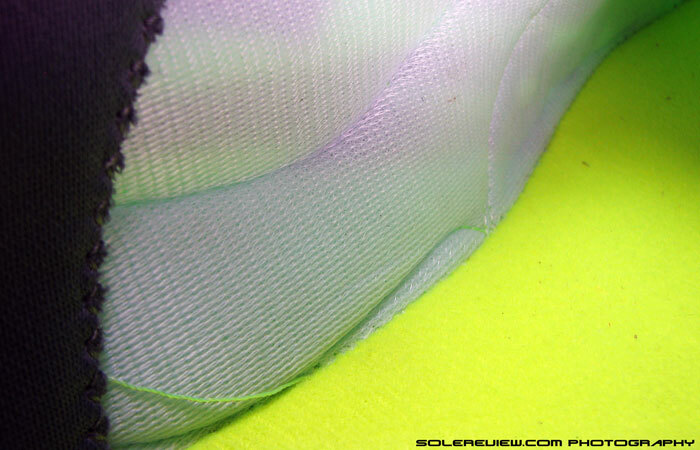 And putting the sockliner means that the seam below the medial toe is no longer felt when wearing the GoRun barefoot. The midsole is one piece injected molded EVA, with circular inlays serving as parts of the outsole. But the positions of rubber insert seem to serve a cosmetic purpose than functional. None of them are in actual, high wear areas. 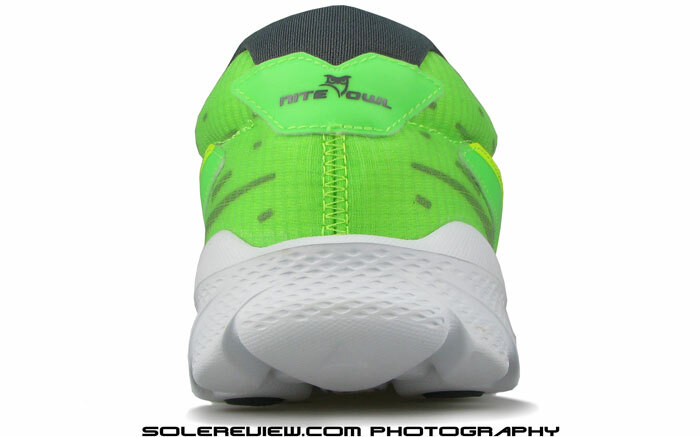 The outsole design looks very fancy, but is found severely lacking in a couple of functional areas. The first one is durability. Ok, first of all, there is nothing wrong with using a outsole which is predominantly foam, lots of brands use it with a proven track record of success. But someone at Skechers did not pay any attention to how they should go about it. Flip the shoe over, and you’ll see rubber pieces placed here and there. Count them, and there’ll be eleven instances of it. Out of which, ten are absolutely useless as far as practical usage is concerned. The EVA pillars under the forefoot compress and feel padded, but wear and tear comes quickly. Regardless of the heel bevel and Skecher’s ‘Mstrike’ claims, rear-foot strikers will land in the back. None of the rubber pods are in critical wear areas, regardless of whether you’re a forefoot or rear-foot striker. All of the brunt is taken by the EVA foam, with evident signs of wear and tear in early stages of ownership. This also brings up another problem, and that of grip. EVA simply has nothing on rubber when it comes to traction. It would been far more productive to insert the rubber under high wear areas instead of cosmetically inserting them around. 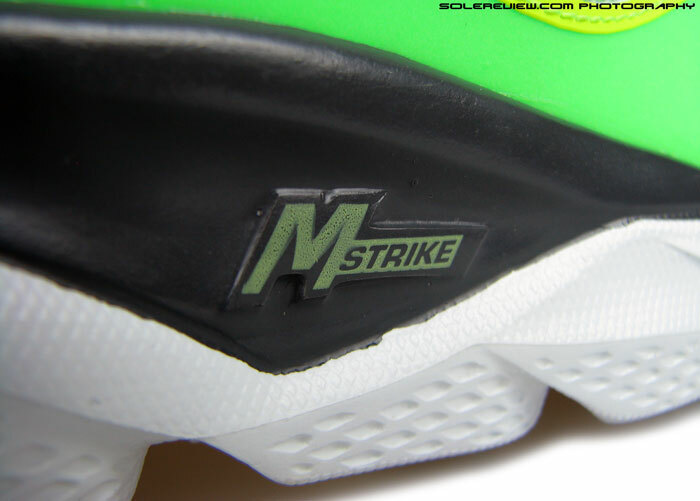 Skecher’s ‘Mstrike’ which supposedly promotes midfoot strike. Does it work? No. Add this to the list of marketing fluff. And what about the Mstrike? Does it work? Sadly, no. Midfoot strike is a misnomer, since nothing of that sort really exists. Closest examples would be runners landing late stage rear foot or early stage forefoot. Even full foot strikes are most cases of early stage forefoot strikes with low angles of dorsiflexion.Very few shoes can actually influence foot-strike. Track spikes could be one type of such shoes, but then the dynamics of sprinting differ completely from the type of running the GoRun is intended for. 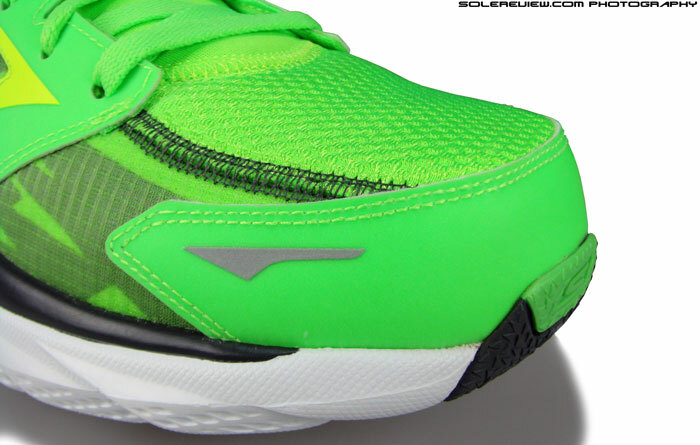 The GoRun Ride 3 heel has a very noticeable, upwards bevel. Skechers says this promotes a ‘midfoot’ strike. Look at that heel spring! 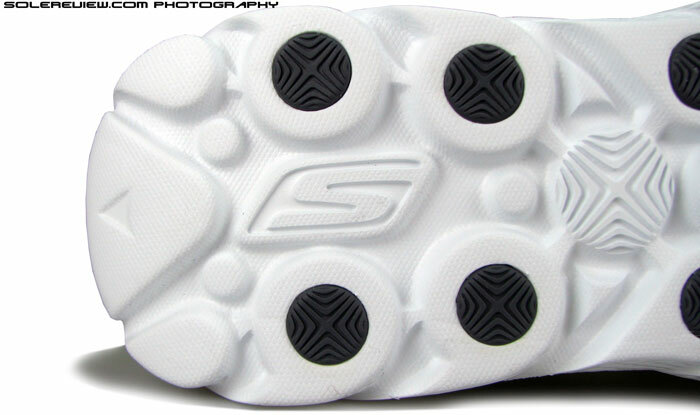 Skechers makes this claim based off the heel midsole design, which you can see has an unmistakable upwards bevel. The logic being that foot strike position should move forward during landings, which Skechers hopes will be near the midfoot. But no such thing happens. In a best case scenario, if you are a heel striker, you might end up striking slightly inside. And if you’re already a rear-foot (not heel) striker, then you should see little change. Skechers’ marketing claim is a bit misleading, as the graphics on the GoRun page show an impact zone right under the midfoot. That is technically wrong too, nobody lands right under their midfoot. However, smarting from their recent ’Shape-up’ incident, Skechers uses a mellower word, saying the shoe ‘promotes’ midfoot striking instead of an emphatic ‘will’. But then many brands will be guilty of that, trying to sell features which promise a lot more than what they actually deliver. So why single Skechers out? What’s important is the Skechers is trying to make progress on the performance side of its business, and its efforts are bearing fruit. There’s a general opinion going around which says that Skechers copied this and that from a X or Y brand. Don’t see the logic in this; Skechers performance footwear doesn’t really feature anything groundbreaking. The shoes have a very basic construction, and that’s a good way to start. Who knows, they might have something up their sleeves. Don’t forget, the founder of Skechers was also the founder of eighties hotness LA Gear, which if you remember was known for its ‘light shoes’. Hopefully, future Skechers will have something novel. Note on ratings: Our numeric scoring of 7.8/10 is based on a total of weighted averages. The attributes namely transition, stability and fit contribute to 69% of total scoring weight, which we see as more important than material (7%), cushioning (7%), traction (12%) and weight (5%). Hence the scores will not add up when a method of simple average calculation is used. 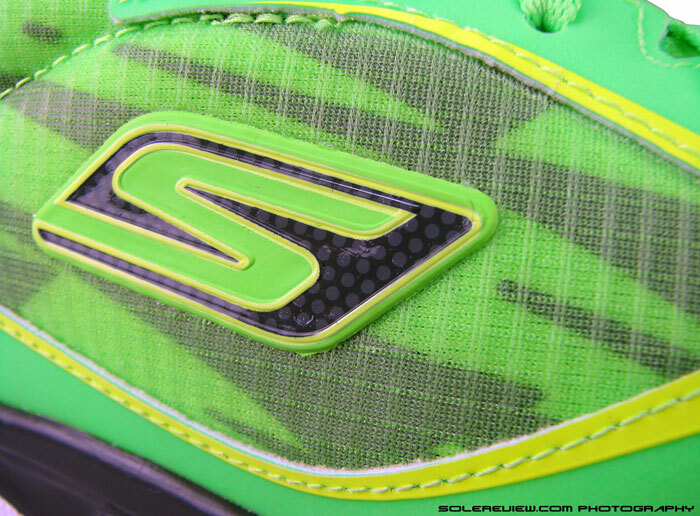 Also note that the ratings is based on using the Skechers GoRun Ride 3 with the removable insole. We felt that provided a better experience than without it, and formed the basis for our score. 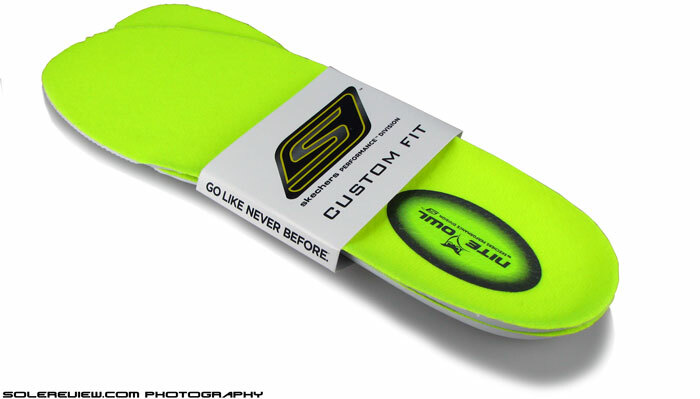 For individual breakouts, please see the dual Sensory Scorecards – with and without the insole. I totally agree that Skechers running shoes are still in their infancy. Overall, the two models I have owned to date, which I ended up giving for charity, felt cheap and poorly constructed. Let us see what time will bring for Skechers performance division. What GoRuns did you own? Both the GRR1 and GRR2. Sloppy, baggy interior was my main complaint about them. Thanks for the thorough review. Cheers. I suspect you will not have liked the GRUltra as the only time I tried them on they felt even roomier and with a excessive drop, way more than the claimed 4 or 8 (with the insoles). You should check out the GoMeb Speed 2, very light racing flats, the sole on these does wear out fast though, maybe because of the additional stress brought on by higher speeds. Thanks. While the Mstrike helps slightly as far as moving footstrike position is concerned, we believe that drastic change of striking can be achieved only with active participation and effort from the runner, and not just the shoe alone. If the runner wants to change his/her footstrike, that can be achieved with any shoe, and not just the GRR. The Ultra is a different shoe, we like some bits and some we don’t – perhaps the reason you feel the heel drop is higher because its loaded drop is greater than GRR or other single density GoRuns due to its firmer midsole. Add to that the GRU’s aggressive lug design. Have our sights on the GM Speed, just that we are waiting for the GoMeb Speed 3 to release! Looks like the GRU review is up, off to read that! I agree that orobably any shoe can be used to transition but the GRR1 was really very helpful because : 1. you really can’t heel strike with it (the GRR2 you can) 2. it felt like a completely different shoe (comfy/light/little structure) so helped with “changing” 3. was not as hard on the calfs as zero drop shoes like the k-swiss blade foot run I had tried before. Don’t think I’ll try the GRR3 as I have a new pair of GR2s just in case. Hi there, love your review. Do you ever compare the upward bevel heel of the 2 shoes, I own a pair of Gorun Ride 3 and the heels of them are not identical to each other, by the image, you can see the right shoe has more bevel heel than the left one. I have no idea whether this is normal in these bevel-heel shoes or may it impact my feet in long term. Yes, we look at symmetry across a pair. This wasn’t a problem in the shoe we tested. This is not normal, should be the same across. These small defects sometimes cause problems during wear, and sometimes not; purely circumstantial. If they cause you problems, it makes a case for product return. Hi, talking about symmetry, do you think the pattern of the outsole should also be necessarily indentical to each other ? 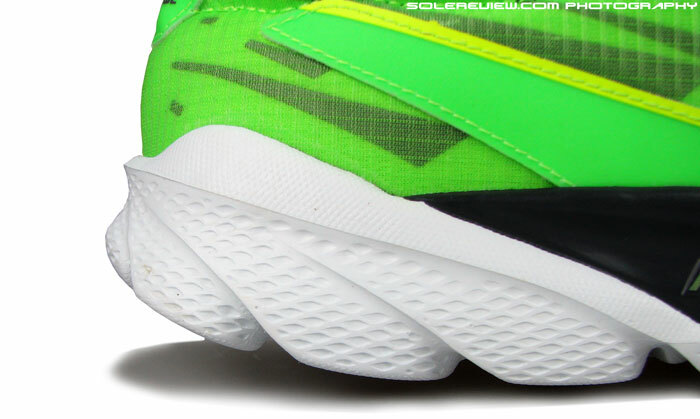 Mine is the Gorun 3 and its outsole is strangely unsymmetrical (see picture, look at the alignment line). When we first saw the picture in your previous post, we thought as much – the right midsole is shorter than left, causing the heel to flare up. This is a manufacturing inconsistency.